Da Lat is beautiful in all four seasons and always ready to welcome tourists. The spring-like weather in the city is the most attractive for visitors to enjoy gentle warm sunshine in the daytime and mild cold at night. In spring, the hill town really turns into a "paradise" of flowers. Flowers are everywhere, from parks to streets and even the red soil paths between villages. Spring is also the right time to find your own places to share and save beautiful memories with your friends and families. Well-known tourist attractions that you can't miss in the Central Highlands city include Love Valley, Than Tho Lake, Hai Mo Pine Hill, Lang Biang Mountain, Truc Lam Temple, Da Lat Railway Station, and others. 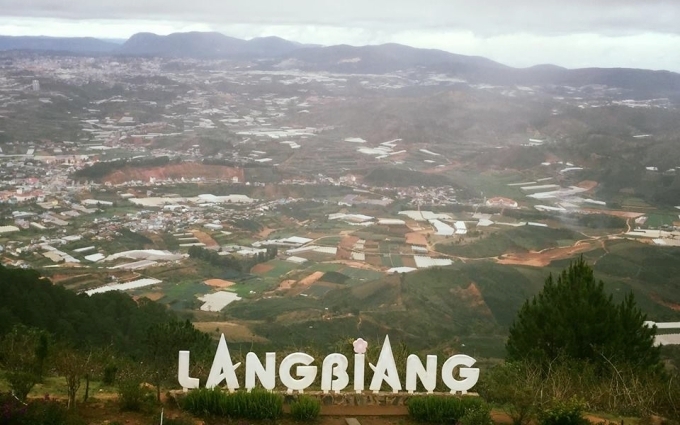 The Lang Biang Mountain is one of the best-known tourist attractions in Da Lat. Da Lat is known as a flower city and the most romantic city in Vietnam. You will be surprised to know that the city has no lamppost as well as traffic police due to heightened public awareness of the traffic laws. It is amazing that the city has no cyclos or bicycles due to its steep terrain. Strawberries have long been known as a characteristic fruit of Da Lat. Red ripe strawberries are fragrant, sweet, and nutritious. Local cuisine is hearty and rich and is available at street food markets and night markets. Visitors can try various types of street food including bread with meatballs (Banh mi xiu mai), grilled rice paper with egg (banh trang kep), and avocado ice cream (Kem bo), among others. Hot soymilk in cold weather will give you a different experience. Bread with meatballs (Banh mi xiu mai) sold at No.26 Hoang Dieu Street, ward 5.